This walk: 2011-4-14. Week Ford, skylark on Horse Ford Cross, ruins of mine buildings, Hootens Wheals mine, leat, water wheel pit, willow, rowan, hawthorn. flat-rod bed, Henroost Mine, Skir Ford, "Dartmoor steppes". Zoomed view to the Week Ford stepping stones visited on the walk on 16 Feb. 2011. A skylark that alighted on Horse Ford Cross. 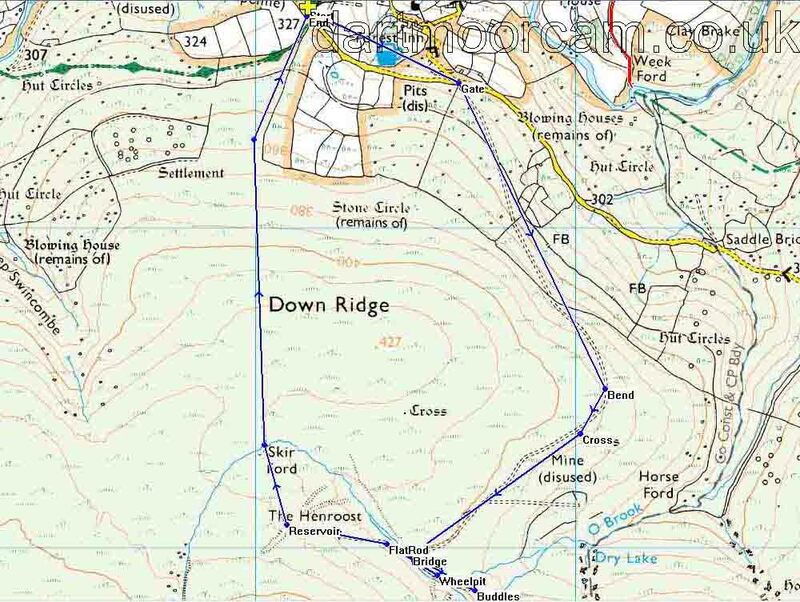 The Dartmoor Crosses web site says: "One of a number of crosses that marks the route of the Monks’ Path. This is the ancient name given to the track that links the Buckfast Abbey with those at Tavistock and Buckland. This path takes a more northerly route than the more commonly known Abbots’ Way." The second building is the remains of the "Barracks", where the miners slept during the week, it is also described as the "dry" where clothes could be dried. Approaching the end of the track out to Hooten Wheals mine. Walking along the old raised leat that carried water to a water wheel: this area was highly industrialised in the past, with a 45 foot water wheel, driving 12 Cornish stamps and 16 Californian stamps to crush the ore.
Two buddles: Geevor Mine web site explains: "A buddle was a device for concentrating tin ore. In the mid-19th century these most usually took the form of an inclined circular pit with rotating brushes; the tin from the stamps was fed into the centre or side of the pit and was graded by gravity, concentrating the heavy ore near the inlet point. In the mid 19th Century the traditional buddle was mechanized to become the round buddle. Originating as pits in the ground with sloping floors, the job of the buddle was to take the finely crushed rock, and wash away the waste material whilst the ore settled and was dug out periodically. Buddles used the difference is density between the heavier tin particles and the lighter waste material. It was a slow and labour intensive process." This might be the old central spindle cap. A presumed piece of military hardware, well-rusted but with a still visible firing pin mark. A different view of the main mine area. Looking down from above the buddles. The area above the mine buildings - spoil heaps. This photo shows the end of a metal pipe that came from the leat towards the buddles. In the water wheel pit: a willow without the long lanceolate leaves of several species: possibly a grey willow, Salix cinerea. Young flower buds and leaves of a rowan (mountain ash) tree, Sorbus aucuparia. Base of the hawthorn tree, Cretagus monogyna. Looking into the main gert of Henroost Mine. Looking back up the fairly steep peaty slope where a about seven "steppes" can be seen, possibly formed by soil slippage when the soil is highly water-logged? MAP: Blue = planned route of the walk. This walk was approached from the Two Bridges-Ashburton road, turning off at the Forest Inn sign near Dartmeet, passing through Hexworthy, passing the Forest Inn and turning right at the top of the hill to park just before the cattle grid. The car park is marked by the yellow cross on the map.